With Halloween just over three weeks away, I have already started making the decorations for the home. Last week I made the Boo Wall Hanging and today I made my Halloween lantern. This lantern normally sits outside with a slightly smaller one and with Summer now over I thought I would use it indoors for over the Winter. 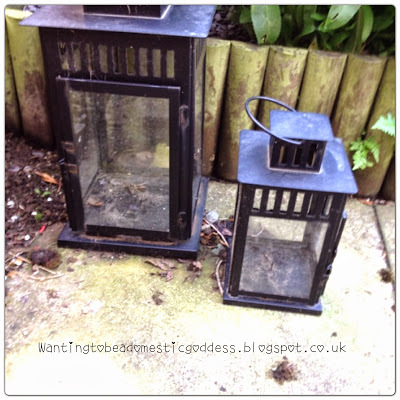 I cleaned the lantern up as there were lots of leaf debris, dust, etc and put in a new candle. 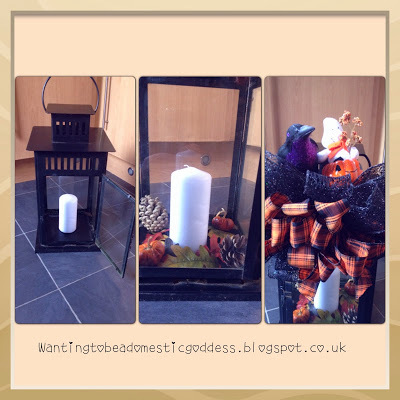 I then added a few Autumn fabric leaves, pine cones and a couple of mini dried pumpkins inside the lantern. I attached a double bow that my friend made me (there are you tube tutorials on this but I still couldn’t do it!). 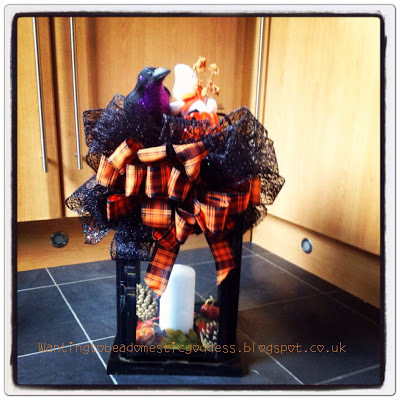 It was made using 5 metres of Orange Tartan wired ribbon and 5 metres of Black glitter mesh ribbon. I then added in a Gisela Graham glitter and feathered crow and a ghost coming out of a pumpkin. Everything apart from the ribbon was what I already had in the house. "I’ve Been Nominated For A Versatile Blogger Award"
Another great post! I'm loving your Halloween decor! You really gave life to those lanterns! Btw, I nominated you for The Sunshine Award. Check out my blog for more details. Thanks Pilar 😃! I'm actually enjoying all this crafting & I've even started buying things for my Christmas crafts. Are you making anything for Halloween? Hi Denise! Thanks for visiting my wee blog and welcome to the blogging world! Its an addictive old hobby! It's so nice to see other Aberdonians blogging too! This lantern is so nice! I love festive decorations, I wish we celebrated halloween like the americans do, they go all out! Any festivity and I'm a sucker! Thanks for dropping in by! I had already registered with the Scottish Blogger Network at the beginning of the week as I found it through Google and have now liked the North East Blogger Events Facebook page. I have found a few other Aberdonians' blogs…..didn't realise there were so many of us! Thanks for that info though cos as a newbie it is hard getting to know other people and get known out there :). I am noticing how addictive blogging can be, I have been staying at my parent's this week as they are away on holiday so haven't been able to do anything to put on my blog. Now I am like hurry up and come back, I have blogging to do!! Maybe we should start going all out for Halloween like the Americans do, then hopefully other people will follow too. What a fantastic idea. Love it. I don't know if I will be organised to do anything this year, but I will admire from afar. Missing Scotland, I used to live in Glasgow and I see your a Tim Burton Fan – me too, totally in love with Johny Depp in Edward Scissorhands, just don't tell my husband. Thanks for dropping in by and for your lovely comments. You are more than welcome to admire from afar if you don't manage to get anything organised yourself. I am hoping to put a few more Halloween related posts up this week and next. I am sure you won't be missing Scotland too much when the colder weather is here :). I'm in Aberdeen so a bit further away from Glasgow but I do like going to Glasgow to do my Christmas Shopping when I can. Oh Johnny….I do love a bit of the Depp, he is lovely :). I haven't watched that film for a long time, so will have to watch it very soon. Don't worry about your Husband, your secret is safe with me ;).